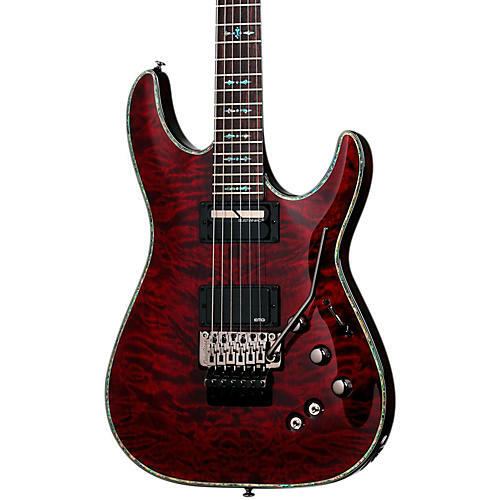 The Schecter Hellraiser C-1 with Floyd Rose Sustaniac Electric Guitar is an electric guitar that delivers tones guaranteed to satisfy any metal player. The Hellraiser's mahogany body has an ultra-access cutaway that really lets you get all the way up the 3-piece mahogany neck. The rosewood fretboard on the Hellraiser C-1 has 24 extra-jumbo frets and gothic cross inlays for an edgy look. Active EMG 81 and Sustainiac humbuckers deliver crushing electric guitar tone. Now you have more options that ever by activating single-coil sounds via push/pull volume knobs. Its Floyd Rose 1000 Series tremolo bridge offers stable tuning no matter how hard you dive. Binding specifically chosen to complement the finish, Grover locking tuners, and black chrome hardware round out the Schecter Hellraiser C-1's killer look. The Black Cherry finish has a quilted maple top. The original Rotomatic now has an improved higher ratio gearing. The 18:1 ratio provides for finer tuning and greater stability. The finer gears provide smoother tuning and a higher degree of backlash elimination. 81: Utilizing powerful ceramic magnets and close aperture coils, the tone was designed with detailed intensity, incredible amounts of high-end cut and fluid sustain. Sustainiac: This Driver/Pickup produces beautiful Humbucker tones when Sustain switch is off, and works as the Sustainiac Driver when switched On. The Sustainiac Driver creates an infinite feedback sustain of string vibrations by electromagnetic feedback. Made with three pieces of mahogany for extra stability. three-piece necks can withstand the test of time. Where standard necks may show aging defects from temperature and moisture changes throughout the years, the 3-piece neck will stay nice and straight for a lifetime of playability.